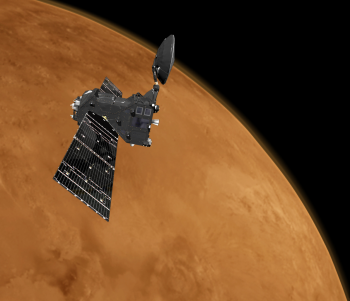 After an approximately 11-week pause due to Mars conjunction and a major software update, ESA’s ExoMars Trace Gas Orbiter (TGO) will restart its aerobraking campaign in September. Aerobraking, you’ll recall, is the year-long campaign being conducted by TGO using the faint drag of Mars’ upper atmosphere to slow it and lower it into its final science orbit, eliminating the need for it to have carried along hundreds of kilogrammes of fuel on its journey to the Red Planet. TGO had a summer ‘vacation’ of sorts. On 25 June, it was commanded to suspend its aerobraking campaign and raise its orbit up to a safe altitude (200 km above the surface) to wait out conjunction season . “We used this period to close out some anomaly reports to get the spacecraft ready to support aerobraking for short orbits, later this year, as well as other technical checks and verifications,” says Spacecraft Operations Manager Peter Schmitz. So what’s a conjunction and why did TGO have to wait it out? 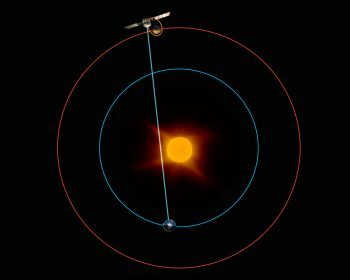 In other words, the presence of the Sun blocks or severely degrades the quality of radio signals passing between ground stations on Earth and spacecraft orbiting, or on, Mars. Bits can be lost, packets can be dropped and even if signals do get through, and the data bitrates, typically running at hundreds of Kbps up to 2 MB/sec, when TGO communicates with ESA’s New Norcia or Malargüe ground stations, drop to just a few tens of bits per second (a typical home or mobile phone Internet connection is many times faster than this). During the height of conjunction, it’s difficult to reliably send routine commands to a spacecraft at Mars (for ESA, these comprise TGO and Mars Express; in future it will include the ExoMars 2020 Rover), and communication limitations already start several weeks before the main conjunction period and last until several weeks after. Further, TGO aerobraking requires the flight control team at ESA’s ESOC mission control centre in Darmstadt, Germany, to send commands and downlink telemetry more or less every day. “During aerobraking we also need to be able to update our guidance commanding every day due to the unpredictability of the orbit following an aerobraking drag pass,” says Peter. This period occurs once every two years, and lasts about two weeks – in this case, 18 July until 4 August – at its peak. If waiting out conjunction season was the only consideration, aerobraking could have resumed as soon as mid-August, when communications once again became reliable. “We decided to use the end of conjunction season as an opportunity to conduct a software upgrade for TGO, which had been in planning since after we initiated the campaign in March this year,” says Peter. While your laptop or tablet at home routinely downloads and installs updates to its operating system software with little more than a brief notice not to unplug the device and please wait for a few minutes, upgrading TGO orbiting Mars at some 390 million km is another challenge entirely. 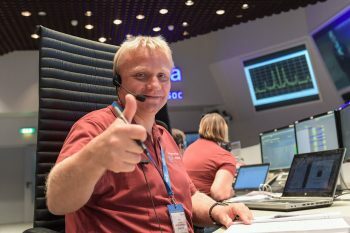 “We uploaded the new software starting on 14 August, sending the new code in four separate batches totalling 3 MB,” says Spacecraft Operations Engineer Johannes Bauer. In total, it was a three week process to upload the software code, install it on one of the two processor modules, reboot with the new software and then install it on the other processor module. The upload took some time, due to the aforementioned low bitrates and due to the necessity to check and verify that the uploaded software was completely and correctly received on board. The new software was stored on board the back-up memory, and booted into operation, and once verified, the software was uploaded a second time for storage on the redundant memory. “The spacecraft is now working as expected,” says Johannes. With the update complete, the team are now preparing for the ‘walk-in phase’ to restart aerobraking. This comprises a series of nine manoeuvres to lower the craft step-wise until it starts ‘feeling’ atmospheric drag, indicating that aerobraking is again underway, and is similar to what was conducted in March this year when the aerobraking campaign initially commenced. The first manoeuvre – the biggest of the nine with a planned ‘delta-v’ (change in speed) of 5.3 m/sec – is planned for Wednesday, 30 August, at about 07:53 CEST, and will bring the craft down to 140 km altitude at pericentre passage. The remaining eight manoeuvres will be much smaller, typically running at 0.8 to, later, 0.2 m/sec and occurring every two to four days, and lowering the altitude at pericentre passage by tens and then later just two or three km per burn. “The target altitude at pericentre passage to restart aerobraking is around 110/115 km on 19 September, but this will depend on actual results and the Martian atmosphere,” says Johannes. The flight dynamics teams at ESOC will be extremely busy during this period, conducting orbit determinations immediately after each burn to assess the performance and confirm the subsequent manoeuvre plan, all on a very tight schedule. “It’s taken a lot of effort from the entire flight control team together with excellent support from our colleagues in flight dynamics, the ground stations and data systems, and we’re looking forward to restarting aerobraking,” says Operations Manager Schmitz. During the software upgrades on 21 August, there was a gap in ground station coverage between the ESA deep-space stations in Argentina and Australia lasting about an hour. While not absolutely critical, it was highly desirable to maintain a link with TGO to monitor progress of the software installation and computer reset/reboot taking place on board. 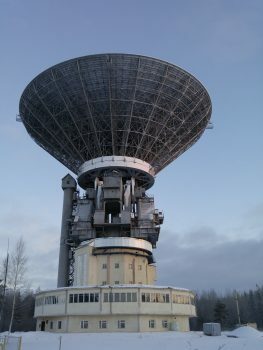 Due to advantageous geography, the Russian 64 m-diameter antenna at Kalyazin, in the Tver region some 300 km north of Moscow, could step in and provide telemetry downlink between 12:00 and 13:00 Moscow time (11:00- 12:00 CEST; 09:00-10:00 UTC). The reception was successful, and the information was transmitted in real time to ESOC for analysis.